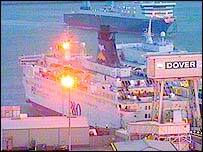 An investigation has been launched after 28 people were injured when a P&O ferry hit a breakwater in Dover harbour. It is thought that one person suffered "rib trauma" and another neck injuries. Ambulances took 10 of those hurt to a nearby hospital, where they were treated for mostly minor injuries including whiplash, bruising and shock. An inquiry into the cause of the accident, which happened at 1730 BST on Friday as the 28,559-tonne Pride of Provence arrived from Calais, has begun. P&O spokesman Chris Laming said the ferry was due to sail to an independent shipyard in Dunkirk on Friday night, for an inspection. He said: "Clearly we want to get the boat back in service as quickly as possible. All the passengers have now disembarked and left Dover." Those hurt included 18 passengers and 10 crew members. The William Harvey Hospital in Ashford, Kent, said it had treated 10 people - all of whom were due to be discharged on Friday night. A spokeswoman said: "Two were more serious but the hospital isn't classing it as a serious incident." None of those injured were children or elderly, she added. A spokeswoman for Kent ambulance service said five ambulances and an air ambulance went to the port following the accident. Many of those hurt were treated by paramedics on board the ferry. Mr Laming said the ferry, which was about a quarter-full with 489 passengers and 159 crew, docked normally after the incident happened at 1730BST. He said: "The ship's equipped with a... data recorder which will help us determine what went wrong." Mr Laming said the weather conditions were good, with a slight breeze, at the time of the incident. P&O stressed that the accident happened as the ship was travelling slowly into port and that it appeared to be undamaged. An emergency number has been set up for anyone concerned about passengers and crew on the ship. People concerned about passengers can call: 0800 0850705. People concerned about crew can ring: 0800 0850704.